Specialty and fine detailed items are crafted using traditional woodworking tools and methods, with each craftsman utilizing their skills to create one-of-a kind pieces. Our cabinet interior floors are flush with the cabinet opening for a clean smooth surface allowing less area for dirt and grime to accumulate. Each cabinet has a solid wood interior hanging cleat that is glued and stapled to the interior of the cabinet box enabling the cabinet installer to securely fasten the cabinets square and plum, without the cabinet back pulling away from the cabinet box. Our drawer boxes are 5/8" thick solid maple with traditional dovetail joints on all corners. The drawers glide effortlessly on the latest European-designed ball bearing, self-cleaning, under-mount slides. These concealed slides have a silent soft-close feature which closes all drawers gently and softly. Our standard concealed, self-closing door hinges also have the latest in soft closing technology, referred to as Blumotion. These items all carry a Lifetime Warranty from their manufacturer. There is a reason why Homestead Custom Cabinetry is one of the few cabinet manufactures willing to back their products by offering a Limited Lifetime Warranty for the original homeowner. It all starts with our vendors and the products we choose to use in crafting our fine cabinetry. We use only the finest grade hardwood and softwoods available with most of our solid hardwood lumber coming from the Appalachian Mountains. All of our lumber suppliers are FSC (Forest Stewardship Council) certified. They are all committed to proper harvesting methods that ensure sustainability for future generations. Our cabinets are constructed of ¾" veneer core plywood made with Columbia Forest Products PureBond® non-toxic technology. This advanced product with no added urea formaldehyde is compliant with the U.S. Green Building Council's Leadership in Energy and Environmental Design (LEED) standards. Our manufacturing process integrates the precision of CNC technology along with proven old world craftsmanship passed down through generations and prevalent in the Lancaster County German community where we operate. Precisely cut materials are constructed into cabinets using hardwood dowels. After the dowels are glued into place the cabinet is pneumatically pressed together ensuring a square, dimensionally accurate cabinet every time. Our finish coatings have been developed by the chemists at Becker Acroma. Their products are always at the forefront of technology and innovation. All the coatings we use in our finish processes are (VOC) and (HAP) compliant that meet or exceed regulations. At Homestead Custom Cabinetry, we're cabinetmakers above all else. 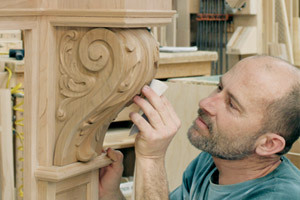 We have a long history of crafting fine cabinetry. We know that by using the finest materials and components available along with the best construction methods and attention to detail, we at Homestead Custom Cabinetry craft some of the finest cabinets available. We work with talented designers, providing them with excellent service and support as they help their clients fulfill their dreams. Our reputation has been built on our commitment to stand behind every aspect of our products with an exclusive Limited Lifetime Warranty. We will be there for our customers long after others have faded away. That is our promise to our dealers and their customers.